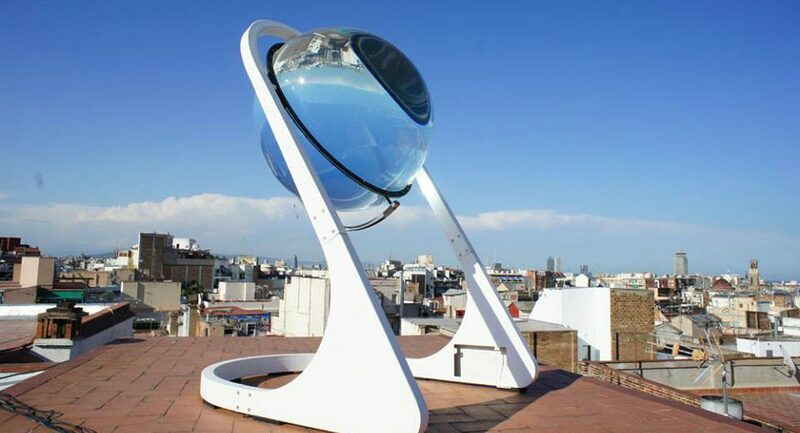 The glass sphere that was a finalist at the World Technology Network Award of 2013 by German designer Andre Broessel at Rawlemon is now seen as one of the most promising advances in solar energy. At that time, he had submitted the design for a “spherical sun-tracking solar energy-generating globe“. Looking a lot like a fabulously massive clear glass marble mounted into an equally massive steel frame, his design was for a concentrating device capable of harvesting enormous quantities of energy when compared to dual-axis photovoltaic cells. The glass sphere -which is hollow and is filled with water- tracks the sun, meaning it moves right along with it throughout the day, optimizing the amount of energy it can harness as long as the sun shines. However, it is not only capable of capturing energy from the sunlight but also from moonlight too. In fact, it “concentrates both sunlight and moonlight up to 10,000 times — making its solar harvesting capabilities 35 percent more efficient than conventional” systems. Additionally, in its latest design, the Betaray is also able to concentrate diffuse light, such as that witnessed on heavily overcast days and prolonged periods of cloudy or rainy weather. As the designer himself explains: “the earth is moving around the sun, and the fixed panel is losing its efficiency”. A glass orb that can rotate and concentrate is an elegant solution, but how does it work? To oversimplify its operation, consider the enormous sphere as a lens, like the one in a camera. At one end it is round and wide, but then it quickly focuses towards the back of the camera lens and through the small aperture or focal point. Instead of capturing an image, though, this device captures the energy of whatever light is in front of it. Whether diffuse light from clouds or direct light from the sun or moon, the lens allows it in and then concentrates it. At the point where the light is concentrated, there is a solar collector or cell that includes a photovoltaic panel, and the equipment needed to convert the light into energy. One enormous consideration is the reduced amount of raw materials needed due to the significantly smaller PV panel size. Typical panels mounted on a home can produce around 200 watts of power, and the standard home has an installation of 25 panels to make a 5 kW array. Obviously, we know that the sun can produce a lot more energy than most panels can create. This means that a system that can concentrate energy as well as capturing and producing it is something significant. Of course, there is much to still be learned about this approach, but the simple fact that the Betaray may be able to capture and condense energy means that it is a superior solution to any pre-existing answers – such as standard PV panels. It is still in its prototyping stage, and the designer is still running fundraising campaigns to get the system fully tested for the market. However, the idea of improving efficiency by 35% is nothing to sniff at. Betaray combines such innovative technologies as spherical geometry principles, dual axis tracking and that it converts daily electricity and thermal energy simultaneously. And it is that final point that must garner a lot of attention from the industry as well as the consumer market. The free movement of electrons in a conductor, which is part of the solar energy process is what panels do. If the Betaray can provide the best of both worlds, converting the electricity and thermal energy, it needs to be given a lot of attention. Naturally, the fact that it is also reducing the silicon cell area by around 25% with identical power outputs is another plus for most enthusiasts and experts. The designer has also proven its success as a free-standing solar car powering station too! We shouldn’t overlook the fact that it is also a visually stunning approach to solar energy. Not only does it look appealing as it has been designed – in its heavy steel frame – but Broessel has also crafted it to be easily integrated into walls and ceilings of buildings. It will be able to withstand years of exposure without any undue impact, and look fantastic at all times! Fortunately, the Betaray is slated to become more than just the large array suitable for mounting in a home or building. It is also being reduced in size in order to work as a desktop charging device for cell phones, tablets and even laptops. Rather than glass lenses, the consumer models will rely on water-filled acrylic polymer lenses and will also be able to handle thermal energy generation in addition to solar energy generation. Is there a downside to this technology? So far, the pundits and enthusiasts have only come up with one potential concern, and that is that the weight of the water-filled spheres may present construction challenges. Though mountable on almost any sort of angle and structure, it appears that the heaviness of the Betaray is the only point that has the market concerned. Be on the lookout for this amazing innovation in solar energy.